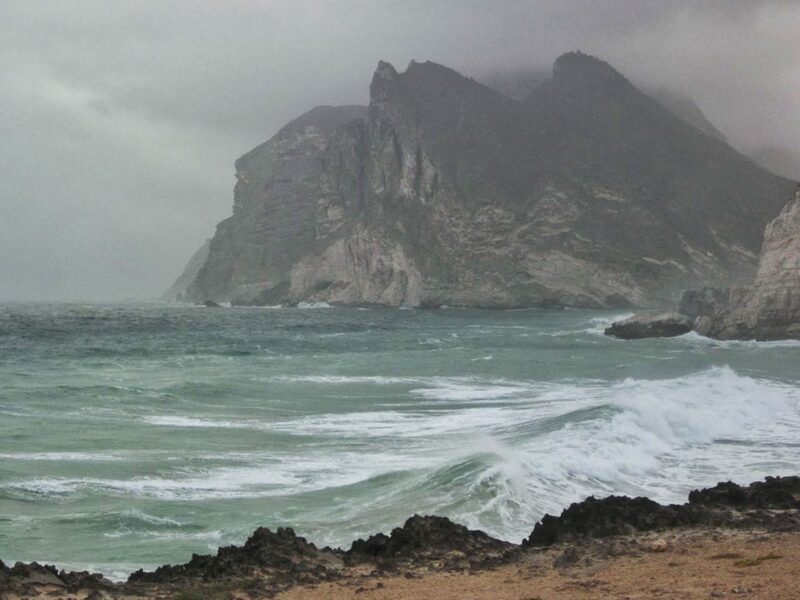 Waves crash against the cliff during the Khareef season in Salalah, Oman. Photo credit: Abu Ayyub. I can still hear the roar of the waves as they crash against the shore. Several gulls fly overhead while not far off the coast, a dolphin peeks out from the dark blue ocean. Behind me rises a wall of cliffs, an ancient mountain that looks like it could come crashing down at any moment. I can barely make out the small road we came down, winding and turning as it merges into the sedimentary rock face. This is the most dramatic coast of Southern Oman. When you feel this small, you are compelled to acknowledge the Creator. This entire region is the hidden gem I cannot put behind me. I was fortunate to call Salalah my home for two magical years. And although some time has passed, not a week goes by without some memory or thought returning to remind me of this unequalled countryside. Unlike her Gulf neighbors, Oman retains a special magical allure, like one opening up the pages of “A Thousand and One Nights.” Here, there was no rush to modernize or build colossal structures or shopping malls. On the contrary, the nation has taken pride in maintaining its culture and traditions; from its architecture to religion, to its white-walled mosques and its frankincense fume-filled souqs. Nowhere is this more evident than in Salalah. Salalah is the largest city in the southern province of Dhofar and edges the Arabian Sea, some 1100km from the capital Muscat. It is famous for its coconut palms, banana plantations, frankincense trees and the cooling rains of the Khareef or Rainy Season. In short, it is a green patch of land in an otherwise harsh desert expanse. On one side, you find the city facing the sea. On the other, a range of high mountains which separate Salalah from the Rubb al Khali or “Empty Quarter”, an immense expanse of almost uninhabited desert. During the Khareef, these mountains turn green with life, running with springs and gushing with waterfalls which flow through deep canyons. The sea changes too, turning into a violent swell, with foaming waves that break upon the coast. This is the favorite time of year for other Gulf Arabs who come in droves to escape the unbearable heat found in the rest of the region. 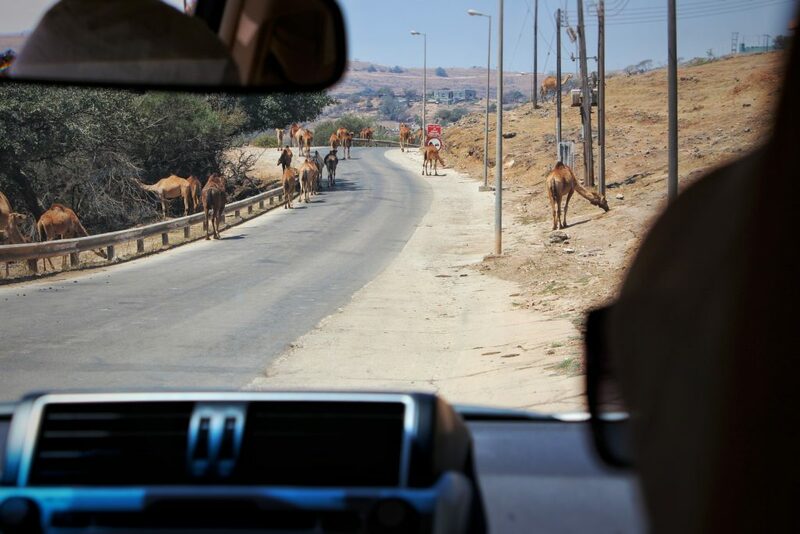 Outside of the Khareef, Salalah is very quiet and it is not uncommon to find camel walking around its sleepy neighborhoods. Like a typical desert city, however, it doesn’t come to life until after sundown. By night, Al Hafa Souq will fill with plumes of incense, spreading sweet aromas throughout the air and tribesman in waist-wrappers and rifles slung over shoulders and groups of women in their colorful “Abu Dhayl” thobes with long flowing tails filling the marketplaces. I was disappointed to learn that the souq has since been closed down, possibly to be replaced by a new hotel or other commercial building. Oman’s ability to retain its authenticity in a time when many of the Gulf States have succumbed to the attraction of high-rise buildings and glitzy shopping malls is what makes it so special, and I am still hopeful that this will last. Natural attractions are everywhere, but enjoying them all will depend on the season of your visit. 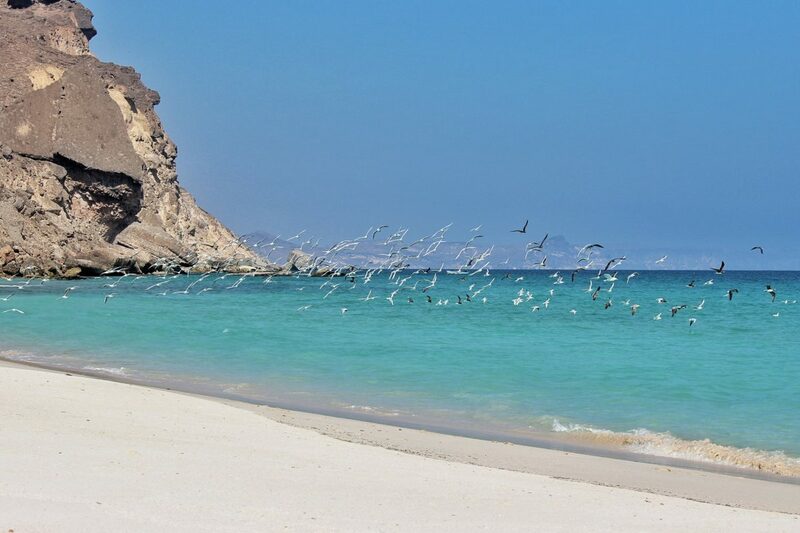 If you like beaches, then Salalah is the place for you. 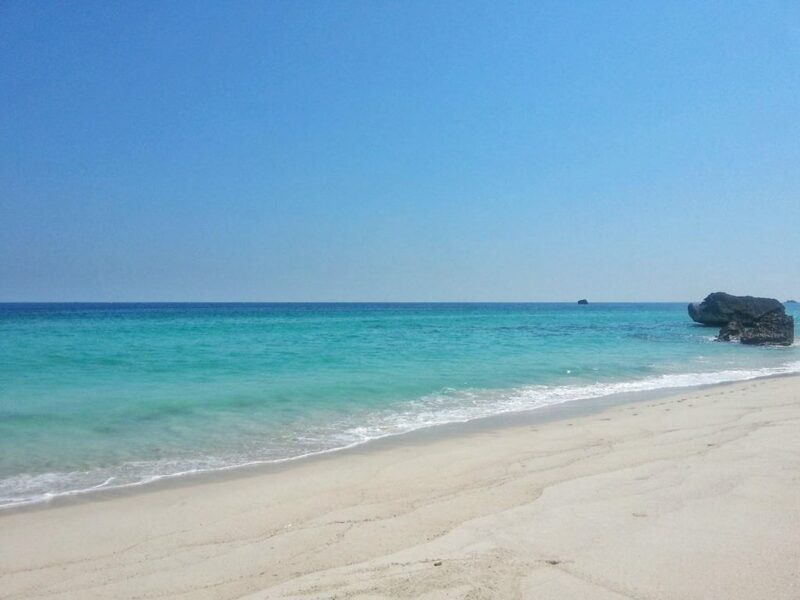 It is not difficult to find yourself an empty stretch of white sandy beach. There, you can pitch up a parasol and enjoy the water in complete privacy, a perfect getaway for families or couples. If the roar of the waves becomes too great, you can cross over the mountains and within an hour or two, you will find yourself in the middle of shifting sand dunes, a perfect place for desert camping. Of course, if you are in Salalah during the Khareef, then there is no better place to be than in the green mountains and misty valleys. 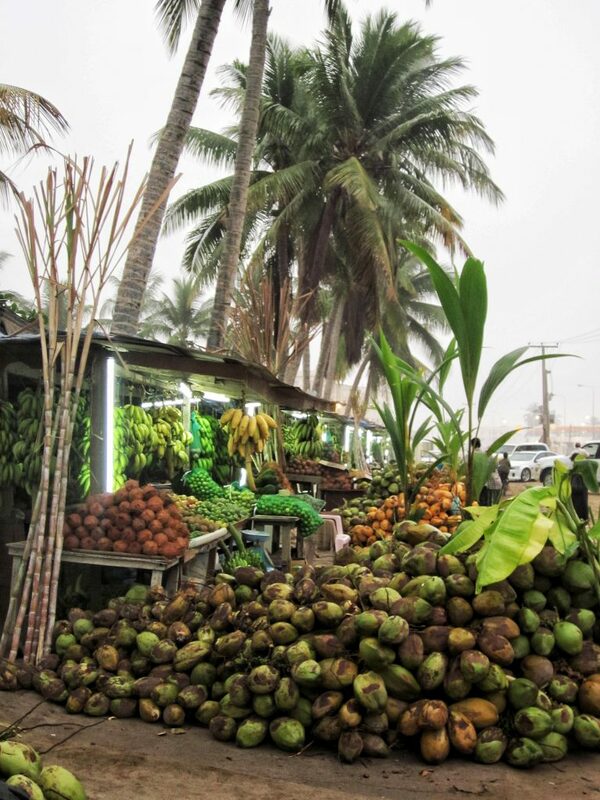 In between these excursions, nothing is more refreshing than pulling up to one of the many fruit stalls along Al Dahariz and asking for some fresh coconut water. Once in hand, sit back and enjoy the cooling effects of this natural and hydrating ice-cold drink…bismillah! If you have been intrigued to visit Salalah, here is another reason to add this gem to your bucket list; did you know that the site of Prophet Ayyub’s (Job’s) tomb is believed to be in this region? Find out what Abu Ayyub discovered during his visit.